Grow Your Family’s Relationship Super-powers! Take look inside our book and Learn about the thinking behind it, in just three minutes! The Relational Book for Parenting (available on Amazon) uses comics, fables, articles, and games to help families’ grow their relational intelligence in the daily back and forth of parenting. It’s a joyful, accessible, parent-friendly cure for what ails our isolating culture, helping us to raise a generation of young people better able to connect, collaborate and innovate across differences. Couple and family therapist Saliha Bava, PhD, and Emmy winning author/illustrator Mark Greene explore our families’ powerful relational capacities. In their book, they chart a playful and transformative path to insuring we all, children and parents alike, can create joyful, lasting personal and professional relationships over the course of our lifetimes. Conversations and relationships go hand in hand. In fact, one does not exist without the other. It is in the verbal and the non-verbal of communication that we come to exist. In our utterences and gestures, as witnessed and responded to by others, we are. This relational call and response is the driving force of parenting. Our kids call out, and we respond. How we respond to them, in turn, shapes their next interaction with us. Who we are, and who we are becoming, emerges from this interaction and communication. As we are shaping them, they are shaping us. Through our mutual participation, we create the messy, joyous process of parenting and being raised. All of life and living, all creativity, all play, all relationships emerge from the constant back and forth of relating. Our book’s goal is to focus on a fundamental consideration: namely what happens when we mindfully center and care for our relationships. Relational thinking asks us to hold uncertainty, notice emergence and stay playful. It asks us to explore how, through the back and forth of relating, we co-create our roles as partners, parents and co-workers, how we are continually re-creating who we are, and how we make meaning. Sample pages from our book! The power of words: we make powerful meanings in the moment we apply language to our emotions. 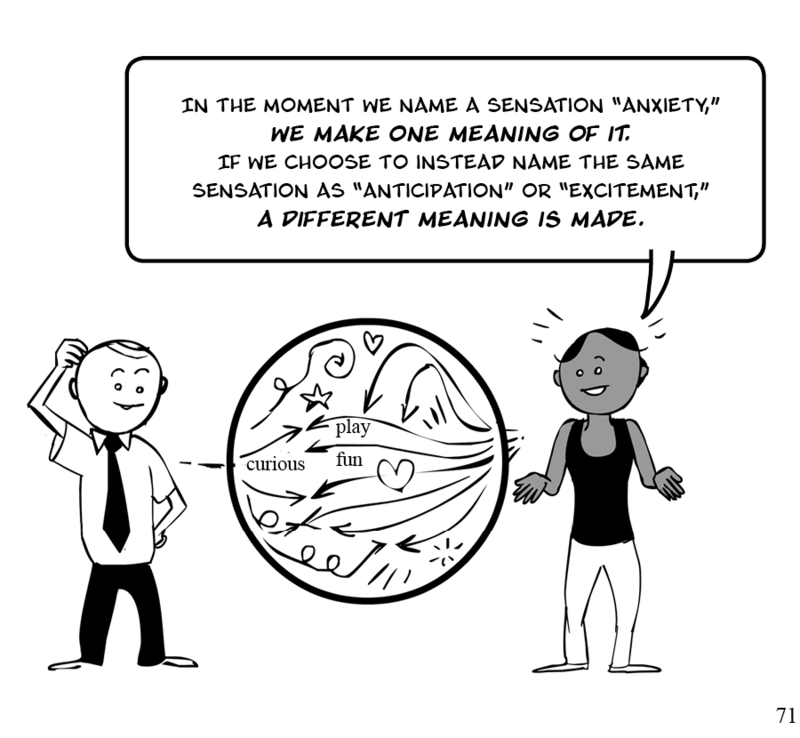 What happens if we pause before labeling these sensations? 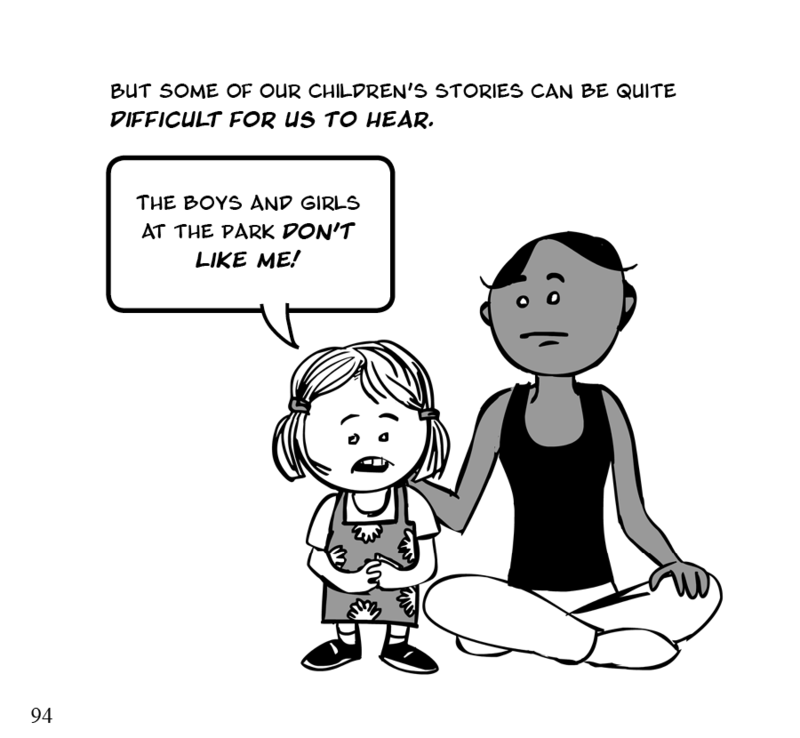 What gets created when we label our children’s emotions for them? Page 71 from the Relational Book of Parenting.